An adviser to Iranian President Mahmoud Ahmadinejad says the push for sanctions won't hurt Iran but alienate the U.S.
(CNN) -- With a fresh set of tough sanctions on the table, Iran lashed out Wednesday against U.S. efforts to punish the nation for its nuclear program. Ali Akbar Javanfekr, an adviser to Iranian President Mahmoud Ahmadinejad, told CNN that U.S. Secretary of State Hillary Clinton's statement that key nations had reached agreement on strong U.N. sanctions will not hurt Iran but instead will alienate the United States. "Mrs. Clinton is taking Mr. Obama on the wrong path," he said. "This will not benefit America. As soon as a resolution on sanctions goes before the U.N., Mr. Obama will be right back in the same place where Mr. Bush was. It will be a dead end. It will mean the end of Mr. Obama." Speaking before the Senate Foreign Relations Committee, Clinton said Tuesday that the United States has been "working closely" with its international partners -- the group known as the P5 plus 1 -- on a resolution to present to the U.N. Security Council. The P5 plus 1 includes the five permanent member of the Security Council -- the United States, China, Russia, France and Britain -- as well as Germany. That draft resolution restates the Security Council's demand that Tehran suspend enrichment activities and other proliferation-sensitive nuclear activities. It requires Tehran to cooperate fully with the U.N. nuclear watchdog International Atomic Energy Agency. Clinton's remarks on the sanctions came just one day after Iran signed a deal with Brazil and Turkey to ship out its low-enriched uranium for processing. But Western nations still believe Iran has military designs, though Iran denies that claim, saying its nuclear program is reserved solely for peaceful purposes. "Iran has remained in violation of previous Security Council resolutions, it is in violation of its IAEA obligations, and that is why we are here today, making manifest and real the dual-track approach that we have pursued," Susan Rice, U.S. ambassador to the United Nations, said Tuesday. "The goal of this resolution is twofold," Rice said of the new draft. "First, to increase the cost to Iran's leadership for their continued defiance of the international community, and second to persuade Iran that it is in its interest to peacefully resolve concerns about its nuclear program. This draft seeks to support, and not replace, our efforts to engage Iran diplomatically." 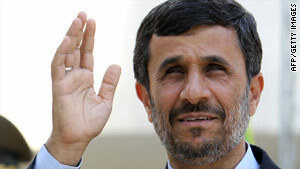 But the head of Iran's Atomic Energy Organization said the sanctions are aimed at sparking political confrontation. "They are always looking for excuses and pretexts to exert political pressure on Iran," Ali Akbar Salehi told state-run Press TV on Wednesday. "Their main aim and purpose is to divert Iran into confrontation with the West [although] we have always stated that we are not after confrontation, we are after cooperation."